UNITED NATIONS, Feb 5 2015 (IPS) – The United Nations, which is the legal guardian of scores of human rights treaties banning torture, unlawful imprisonment, degrading treatment of prisoners of war and enforced disappearances, is troubled that an increasing number of countries are justifying violations of U.N. conventions on grounds of fighting terrorism in conflict zones. 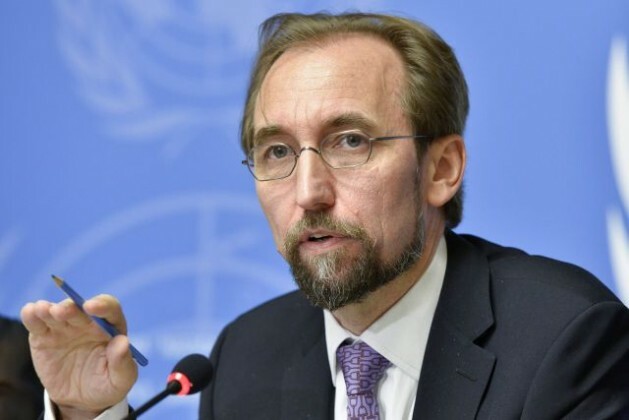 Taking an implicit passing shot at big powers, the outspoken U.N. High Commissioner for Human Rights Zeid Ra’ad Al-Hussein of Jordan puts it more bluntly: “This logic is abundant around the world today: I torture because a war justifies it. I spy on my citizens because terrorism, repulsive as it is, requires it. Speaking Thursday at the Holocaust Memorial Museum in Washington D.C., Zeid said the world needs “profound and inspiring leadership” driven by a concern for human rights and fundamental freedoms of all people. “We need leaders who will observe fully those laws and treaties drafted to end all discrimination, the privation of millions, and atrocity and excess in war, with no excuses entertained. Only then, can we help ourselves out of the present serious, seemingly inexhaustible, supply of crises that threatens to engulf us,” he declared. Last year, the U.S. Central Intelligence Agency (CIA) was accused of subjecting terrorist suspects to “enhanced interrogation techniques”, including water-boarding, sleep deprivation and physical duress. The Western nations, who have been involved in air attacks inside Afghanistan, Iraq, Syria and Libya, have both justified and dismissed thousands of civilian killings as “collateral damage” – even as they continue to preach the doctrine of human rights and the sanctity of civilian life inside the General Assembly hall and the Security Council chamber. And, meanwhile, there are several countries, including Jordan, Pakistan and Saudi Arabia, which continue to justify the death penalty in the execution of terrorists and the public flogging of bloggers and political dissenters – as part of the war against terrorism. Last week, the Islamic State of the Levant (ISIL) was accused of brutally killing a Jordanian air force pilot because Jordan was part of a coalition launching air attacks on ISIL forces. In return, Jordan reacted swiftly by executing two convicted prisoners – with links to al-Qaeda – as a retaliation for the killing of the pilot. “It was an eye for an eye,” a Jordanian was quoted as saying. Last December, 117 of the 193 U.N. member states adopted a General Assembly resolution calling for a moratorium on the death penalty. But the executions have continued. Javier El-Hage, general counsel at the Human Rights Foundation (HRF), told IPS his group applauds the high commissioner’s call for ‘better leadership’ and a ‘global rethink on education’ as the two main weapons the world could benefit from in the struggle against the ‘causes of the worst conflicts and atrocities across the world,’ present and past. Specifically, on the area of leadership, Prince Zeid called for leaders that are ‘driven by a concern for the fundamental freedoms of all people,’ who fully observe international human rights treaties. “As the high commissioner suggests, the worst atrocities of human kind have in fact been caused by bigoted, chauvinist authoritarian leaders representing a fraction or even a majority of a country’s population, but who, through achieving a monopoly in education and information by cracking down on dissent and independent media, pushed radical economic, nationalist, racist or religiously extremist agendas in a way that trampled the rights of minorities and dissenters of all kinds,” Hage added. For example, nationalist, racist or religiously extremist agendas were used against Jews in Germany, Ukrainians in the Soviet Union, Kurds in Turkey, and against blacks until recently in apartheid South Africa and even most of the Western World until the abolition of slavery. These discriminatory agendas are still being pushed today against the Uyghur and Tibetan peoples in China and against Christians and different Muslim faiths under theocratic dictatorships across the Middle East, including the ones like Saudi Arabia or Jordan that are friendly to Western democracies, as well as the ones like Iran or Syria that aren’t. Zeid said international human rights law represents a distillation of humanity’s experience of atrocities, and the remedies to prevent them. But today, leaders are too often deliberately choosing to violate those laws, he complained. He pointed out that forceful reprisals against atrocities – including attacks on children and “the savage burning of my compatriot the pilot Mu’ath al Kassassbeh” by ISIL – are having limited impact. HRF’s El-Hage told IPS throughout the 20th Century, leaders of the Soviet Union and its satellites around the world installed single-party state apparatuses — with strong propaganda machineries and no independent media, instead of open education — that advanced radical economic agendas to the detriment of the majority of their populations. This not only triggered atrocities, such as mass starvation, which were not a result of direct physical repression of minorities (like the Ukrainian famine), but instead of an economic policy that rejected individual rights and limited the ability of small farmers and business owners to provide for themselves by controlling their own mobility, access to resources, property rights, freedom of information and their ability to associate with others in mutual cooperation. While promoting the idea that they could help the masses, these authoritarians let the individual members of such masses suffer—even starve, he added.